Local residents in Workington are learning how to live happier and healthier lives thanks to health and wellbeing sessions at Moorclose Community Centre. 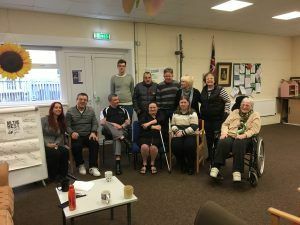 £904 was awarded to Healthy Hopes, based in Workington, from the Sport Relief Community Cash Fund to run free weekly workshops for local people, who often don’t feel connected to their community. Healthy Hopes was set up in 2015 by Viv Nichols and Kerry Manson, who both have backgrounds in mental health. The workshops, which are centred around stress management and coping strategies, behavioural change, building self-esteem and confidence and goal setting, encourage individuals to live healthier and happier lifestyles. As they learn the skills to cope with these issues, they build relationships with each other and develop their own support networks, making their communities a better place to live. Initially, attendance to the workshops was low, due to low confidence and the vulnerability of some people so a befriending project was set up to increase engagement. Local volunteers were recruited and trained to build trusting relationships with socially isolated, vulnerable people and accompany them to the workshops. Kerry Manson, Director at Healthy Hopes said: “The purpose of the sessions is to get people who feel socially isolated together and promote health and wellbeing. We offer relaxation and different activities which are all person-centred.